The SRC, inviting the members of the Executive Committee of the ICCEES (International Council for Central and East European Studies), organized the International Symposium, "Where are Slavic Eurasian Studies headed inthe 21st century?" 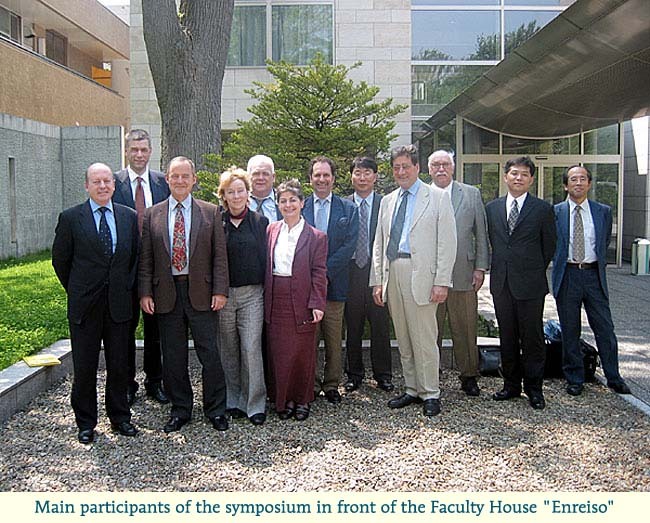 on 27 May 2004 at the SRC with the co-organizers, the JCREES (the Japanese Council for Russian and East European Studies) and the 21st Century COE Program, "Making a Discipline of Slavic Eurasian Studies." On this unique opportunity, the members of the committee paid a courtesy call on Nakamura, the president of Hokkaido University, exchanging opinions on Slavic studies in Japan and the foreign relations of the University. The aim of the conference was, as the program of the conference reads: "The world is changing rapidly; the collapse of the communist regimes, integration of the regions, globalization, and the wars against the World Powers and the Terrorists. The Slavic Eurasian regions, the former Soviet Union and Eastern Europe, have been the inside factors and actors as well in the whole process of making a new world order in the 21st century. We stand in front of new tasks to rejuvenate the area studies including not only our regions, but also other regions. It is a tremendous opportunity to invite the leading scholars of ICCEES and to discuss on the today and the future of Slavic Eurasian Studies freely and border-crossingly. The organizers wish that the symposium be fruitful and helpful to create a new horizon for the future development of the area studies in the 21st century." The participants from ICCEES were Stanislav Kirschbaum, York University, Canada (Slovak politics and history), James Millar, George Washington University, USA (Russian economy), Leslie Holmes, Melbourne University, Australia (Russian politics), John Elsworth, Manchester University, UK (Russian literature), Thomas Bremer, Munster University, Germany (Russian History), George Mink, Sorbonne University, France (Russian and Central European Politics), Lena Jonson, Institute for International Relations, Sweden (Russian policy toward Central Asia), Waldemar Melanko, Finland (Bibliography of St. Petersburg and Ukraine), and Hiroshi Kimura, Takushoku University, Japan (Russian diplomacy). From the Japanese side, the executive members of the JCREES, the members of the directors' board and the academic staff of the SRC took part in the meeting, and two Korean colleagues also participated from Hankuk University of Foreign Studies in Seoul. In the symposium the members of the Executive Committee gave statements on the current issues and trends of Slavic studies in each country, then the participants exchanged opinions and remarks. The symposium could be the first almost unprecedented opportunity to discuss these issues internationally among the leading scholars from all over the world. Among the many noteworthy issues discussed were the serious budgetary cuts due to the end of the Cold War which have caused difficulties in those countries where communist studies were state projects, such as the English speaking countries — the USA, the UK, Australia, and Canada — and Germany. On the contrary, in the rest of the countries, the financial situation was the opposite. In France, for example, Russian and East European studies were more encouraged, or new interests were born on the Baltic states in Sweden. In Finland also the people newly recognized their special and long history with Russia. In other words, Slavic studies in these countries were given a new momentum due to the collapse of the communist regime. Japan can be a case for the latter group where new fields of research interests developed, such as Ukrainian studies, Caucasian studies, Central Asian studies, and so on. Needless to say, these studies are more or less intensively carried in many countries and we can expect significant progresses in the near future in these research fields. Another hot topic at the conference was how to name the changing mega area: Enlarged Eastern Europe, Enlarging Europe, Eurasia, Slavic Eurasia, Eastern Europe and Eurasia, and so on. Each name may reflect each way of approaching the problem, and the arguments lasted endlessly. It seemed that the topic could be very current for the executive committee. The topic, otherwise, is the focused issue of the 21st Century COE Program, "Making a Discipline of Slavic Eurasian Studies" at the SRC, and is the central question of the regional identity of the peoples concerned. Therefore, the members of the SRC actively participated in the discussion with concrete proposals how to organize the studies with the local scholars in the related reas. The time flies so quickly. Professor Kwon from the Korean university gave a statement on the history of Russian studies in Korea at the symposium. The Korean participation was a new development resulting from the SRC's cooperation with Korean colleagues including not only from Hankuk University, but also Seoul University, Korea University, and other universities in our neighboring country through various academic exchange programs. The proceedings of the symposium will be available in the near future on the SRC website and through other forms of publication.